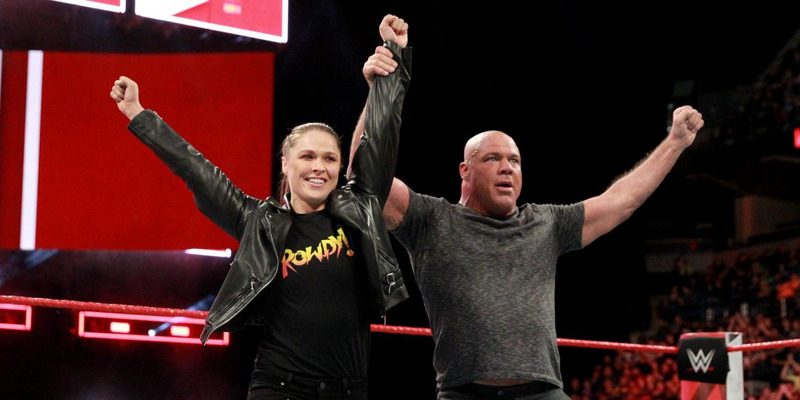 WWE.comRonda Rousey and Kurt Angle stand tall at the start of ‘Monday Night Raw’ after WrestleMania match is made official. Ronda Rousey will make her official in-ring debut for WWE at WrestleMania. Rousey will join up with “Monday Night Raw” general manager Kurt Angle to face off against Stephanie McMahon and Triple H.
It won’t be Rousey’s first time in the ring at WrestleMania, having already made a surprise appearance with The Rock in 2015. Ronda Rousey is set to make her official WWE in-ring debut during a tag-team match for WrestleMania. 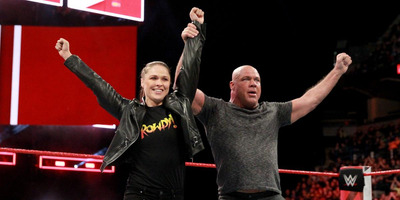 During a segment on “Monday Night Raw,” Rousey initially suggested she face “Raw” commissioner Stephanie McMahon in a singles match. Triple H interrupted the negotiations, leading general manager Kurt Angle to set up a tag team match between the two parties – Ronda Rousey and Kurt Angle vs. Stephanie McMahon and Triple H.
In classic wrestling fashion, things devolved a bit from there, with Angle and Triple H scrapping in the ring, and Rousey finishing off McMahon with a Samoan Drop. You can watch the segment play out below. For Rousey, while the match will be her debut as an official member of the roster, it won’t be her first time in the ring at WrestleMania. She made a surprise run-in to help The Rock back in 2015, once again facing off against Triple H and Stephanie McMahon. Rousey got off to somewhat of a rough start in WWE, but has turned things around in recent appearances and is getting better every time we see her on camera. After an awkward surprise appearance at the Royal Rumble, Rousey put Triple H through a table last week, much to the delight of the WWE universe. WWE now has four weeks to build the story further and make sure Rousey is ready for in-ring action before WrestleMania 34 in New Orleans on April 8. You can get started with the WWE network here.